BOOK YOUR FRENCH SKI SCHOOL ON LINE ! PLEASURE IS SOMETHING TO BE LEARNT… IN CONFIDENCE ! 250 French ski Schools (ESF) will statisfy all your expectation : 17000 instructors are there to welcome you. Whatever your skiing style or choice of ski speciality, come and join the ski professionnals who know how to teach you the essential techniques whilst making it a pleasure all the way. PLEASURE ON 6 MOUNTAINS… REACH THE SUMMITS WITH ESF ! Tailor made within the ski resorts of your choice : easy access, respect for the environment, quality client reception, diversity of ski resorts. The Vosges: the famous « ballons » in the Vosges combine forests, bare plateaux and lakes. Every type of skiing is possible in this marvellously conserved natural decor. The Jura: the vast spaces and beautiful forests of this young mountain range attract cross-country skiing enthusiats from all over the world. 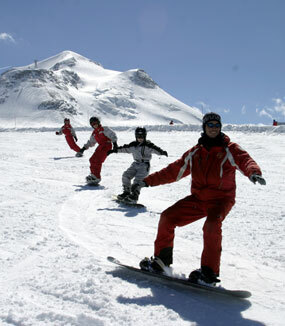 Alpine skiers enjoy the pistes which are sometimes extremely technical and the incomparable calm of the landscape. The Northern Alps: Dauphiné-Isère, Haute Savoie and Savoie, alpine skiing was born in this grandiose natural areas. Every type of landscape and mountain architecture coexists in the largest skiing area in the world. The quality of the roadway system is exceptional. In the Northern Alps you can ski however you want and whatever your level of skill. The Massif Central: the central highlands of France with its chain of extinct volcanoes has conserved the wild beauty of its natural spaces whilst providing modern, top quality skiing amenities. A thousand authentic facets over and above the skiing itself. Pyrenees: astride the border with Spain, the Pyrénées offer extraordinary constrats. Sheer summits, gently contoured valleys and villages of stone-built houses sweep into each other in an unbroken sequence. A skiing paradise !